First of all, Opera Flow is very convenient. Unfortunately, enabling Flow also means that (the last 3) tabs used on Opera desktop are synced to Opera Touch. Although I understand the use case for some people, for me it only adds useless speed dials (the last 3 opened tabs) to Opera Touch. Therefore, I would like to request an option to disable “Continue from computer”, so disabling the history sync from Opera desktop to Opera Touch. RE: How is sync data visible at sync.opera.com if it's encrypted with a password? I'm wondering the same. I'm testing Opera for Android 47 beta and have setup syncing. For encryption I have selected "Use a sync passphrase". The line under this option clearly states: "Encrypts all synced data". However, when I login on sync.opera.com with ONLY my Opera Account credentials - I have NOT entered my sync passphrase - I see data like Speed dials, Open tabs, History etc. When you state "Encrypts all synced data" this should not be possible without entering the passphrase first. Today, I have tested it again. To start fresh, I have removed all data by selecting "Reset sync data" on sync.opera.com. When I first setup sync (including passphrase encryption) on Opera 54 for Windows and then login on Opera for Android 47.0.2249.129124, the data shows encrypted on sync.opera.com. Then I removed all sync data again. When I then setup syncing on OfA ONLY (including "Use a sync passphrase"), all data on sync.opera.com is visible, hence not encrypted. The names of a few of my bookmark folders and bookmarks contain a single ampersand (&), e.g. Test 2 & links. As shown in the screenshot below, in bookmarks (see 1) it’s correctly displayed. 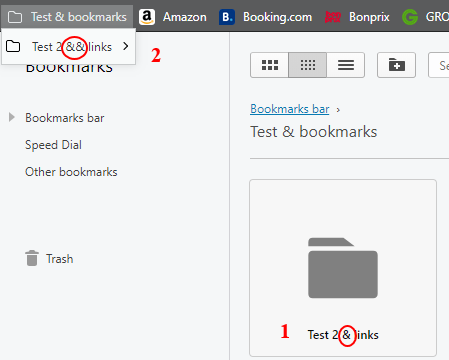 However, in the Bookmarks bar (see 2), the name contains 2 ampersands. I’m running Opera 53.0.2907.110 on Windows (this behavior existed at least a couple of versions before as well). @leocg I have used sync before, but I have selected "Reset sync data" on sync.opera.com first to remove all data. The OfA 47 install was a fresh one, so no previous data.